250 lb. capacity. Overall size: 42''Hx18-7/8''Wx 14-3/8''D. Heavy duty 1'' diameter steel frame. Flat free solid rubber tires (8''x2-1/4''). Heavy duty axle. Toe plate 14''Wx7''D. Replacement wheel: Orgill sku# 9003518. 400 lb. capacity. Heavy duty 1" diameter steel frame. 8" x 2-1/4" flat free solid rubber tires. Heavy duty 5/8" axle. Toe plate: 14" W x 10" D. Overall size: 47-1/2" H x 19" W x 17-1/4" D. Replacement wheel: Orgill sku# 9003518. 600 lb. capacity. Heavy duty 5/8" axle. Heavy duty 1" diameter steel frame. 10" x 3-1/2" pneumatic tires. Heavy duty ball bearings. Steel rims. Toe plate: 14" W x 9" D. Versatile P-handle design. Overall size: 51-1/2" H x 21-5/8" W x 18-1/2" D. Replacement wheel: Orgill sku# 8994816. Gleason Hand Truck, 800 lb Load Capacity, 10 in Wheel, Pneumatic Wheel, D-Handle Handle, 50 in Height X 19 in Width X 29 in Depth, Steel, Charcoal Gray, 2-1/4 in Width Offset Hub, 5/8 in Ball Bearing 800 lb. capacity. Heavy duty 1" diameter steel frame. 10" x 2-1/2" flat free solid rubber tires. Toe plate: 18" W x 8" D. Versatile P-handle design. Heavy duty 5/8" axle. Straight wheel fenders. Overall size: 51-1/8" H x 19-1/4" W x 17-1/2" D. Replacement wheel: Orgill sku# 9006198. 800 lb. horizontal position capacity. 400 lb. vertical position capacity. Heavy duty 1" diameter steel frame. Full size wheel fenders. 4" x 1-1/4" TPR casters. 10" x 3-1/2" pneumatic tires. Heavy duty ball bearings. Steel rims. Toe plate: 14" W x 7-3/4" D. Adjustable height handle with 2 positions. Heavy duty 5/8" axle. Overall size vertical position: 54-1/4"- 58-1/4" H x 21-1/4" W x 17-1/4" D. Overall size horizontal position: 44-1/2" H x 21-1/4" W x 48-3/4" D. Replacement wheel: Orgill sku# 8994816. Lightweight for easy storage and transport. Frame folds to 6.5" flat. 250 lb. weight capacity for stepladder. 175 lb. 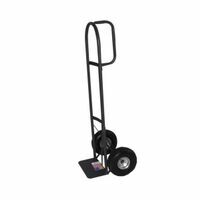 weight capacity for hand truck. Smooth rolling 4" diameter rubber wheel. Space-age polypropylene, extra sturdy 11" W x 9" D steps. 700 lb. capacity. Steel stair climber with rubber treads. Protective plastic pads help avoid scratches. 6" x 2" TPR tires. Toe plate: 22" W x 5-1/2" D. Handle driven belt release mechanism. Two 2-1/2" width webbed straps. Extension box lifter. Overall size: 60-1/8" H x 22" W x 11"-2/3" D. Heavy-gauge steel construction with dropped forged fork arms that provide high strength and durability. Foot and hand controls for easy operation, speed-lowering valve adjusts descent speed freely and a 200-degree steering area for added maneuverability. Wheels have long life lubricated bearings with dust proof caps for trouble-free service. 7-1/2" total lift height, 2-3/4" lowered fork height, 20-3/8" eight of handles, 48" fork length, 27"/6-1/4" width over the forks, 3-5/8"/3" width F-B fork wheel, 195 lbs. truck weight.